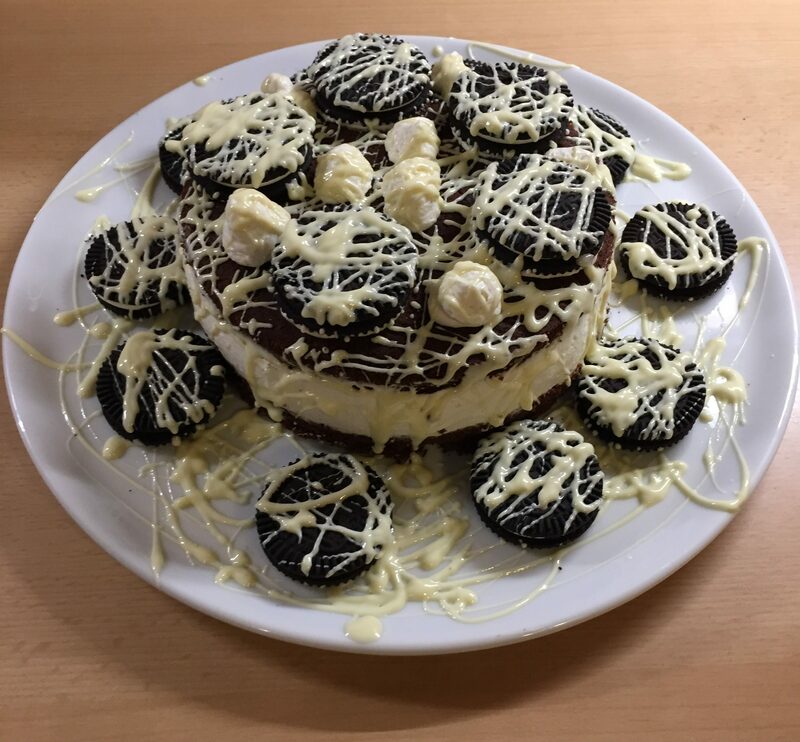 A lot of people like Oreos, and since there are gluten free „Cocoa-Double Cookies“ as well I thought: „Why not make a gluten free Oreo Cheesecake?“ and this is it. With a cake recipe for brownies for the cake. Take the gluten free BaukHof Brownie Mix and make the vegan version! But add 50ml more water than it says on the recipe. Prepare it according to the instructions on the backside, but instead of baking it in a brownie pan take a 23 springform pan. Bake it, then let it cool completely! This step is important to keep the cream cheese mixture from melting off the gluten free Oreo Cheesecake later. Mix one pack of cream cheese (300g) with one cup of Schmand (200g) and one small container of 40% fat Speisequark (250g). Add one package (8g) of vanilla sugar. Then two packages of liquid Bourbon-Vanilla aroma. If you don’t have liquid vanilla aroma take 2 teaspoons of powdered vanilla aroma, not vanilla sugar again. Stir until it’s a smooth paste. Then whip 250ml of whipped cream. I like to take a plant based one, because I feel like if they get stiffer and stay stiff for a longer time without having to add extra powder for stiffness. And take a spatula and gently mix the cream with the cream cheese mixture. Cut the brownie cake in half horizontally. Then take the upper part away and fill the pan with your cream cheese mixture. Afterwards place the second half of the brownie cake on top again and set the entire thing to cool for at least two hours. Then take a knife and cut around the sides of the cake to separate it from the pan completely. Once done, take a tablespoon and smooth out the cream mixture. At this point you are done with the Oreo cheesecake itself, but you can decorate it as well. I used one bar off white chocolate, melted it in a pot on the stove, then pulled it in a freezer bag, cut off one edge and drizzled it over the cake. Last but not least I took gluten free Oreo-like „Cacao Double Cookies“ from Coppenrath (my favorites) and decorated the gluten free Oreo Cheesecake and the plate with them. When you need the products, just click on the pictures! It will take you to Amazon where you can order them directly.